We, here at the Middle Stump have fallen out of love so here we respond with our very own Dear Jon break up letter. It is with great sadness that I admit that we just can’t go through with this anymore. You have humiliated me in front of all of our friends once too often and now I just can’t bear to read your column. I wouldn’t mind but you have failed to point out that there is a donation from the book royalties to Melanoma UK. You also failed to point out that in our book we mention that sledging has been occurring since the year dot, or at least since a bowler had a hard ball in his hand. I’m sure you will read your colleague Steve James’ (who did a fine piece on Trott and depression today) reply when faced with Rudi Bryson in 1996 in our book, or quotes from the Bodyline series and WG Grace. You also fail to mention that we have done some decent work ourselves at the Middle Stump and have raised awareness recently of issues such as melanoma, depression or other charities and their events that we have helped promote or raise awareness about in some form or other. To link us with being witless also rankled and really hurt our precious feelings, although I am sure your political colleagues at the newspaper will chortle at our Tony Blair in Durham yarn, where he can be found playing Scrabble as it is the only time he will find WMD in a rack! You even used one of our tweets in your ‘tweet of the day’ in your newspaper column last summer, a much happier time between us. Sledging has occurred for years but only in this media obsessed age has it now become such a major talking point. It’s Test cricket and sides go at each other hard, something, my love, we will never get the opportunity to experience. 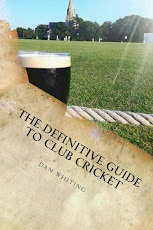 Amateur cricketers we may be, but ones who have experienced something like 1200 games at various club levels, and have heard many an anecdote or a story in cricket pavilions that we are regaling our readership with. Cricket isn’t all about the England games shown on Sky you know? Maybe your own lack of experience of being in a changing room with your team mates has come between us. What most of the cricketing sphere finds acceptable my sweet pea, you seem to object to. I hope you don’t read our memoirs too much, mon chéri, as you admitted on that fateful day that you only gravitate towards it when you feel too satisfied in life, although most of our readership will maintain it is fine toilet reading material. There are other people out there for us, and not all people will treat us like you. You just don’t like our banter and with that in mind we bid you farewell. Our experience and maturity tells us to handle this break up in a grown up fashion and we would never be so immature as to refer you to the last two words of the famous reply in the Arkell v Pressdram case of 1971 of which you can no doubt find on the internet somewhere. Keep the link and keep the book, that’s all our possessions sorted. Heartbreaking. Just heartbreaking. Just did not see this coming. Do you reckon that bird is trying to grab his pole? Well said boys. JL has upset quite a few people over the years and consistently demonstrates a lack of empathy for the game. This time though we were spared from the use of swathes of impressive language taken directly from the Oxford English dictionary. Breaking up is hard to do with Mr Liew. A cricket columnist cut from the same arrogant cloth as the old Etonians governing our country today.